Siemens PLM Software released Solid Edge ST8. Beta CAE released ANSA v15.3.0. A senior CFD specialist in building services is being sought in Hong Kong. The call for papers is now open for the COMSOL Conference 2015 (Boston, 7-9 Oct) with an early due date of 19 June and final due date of 31 July. Screen capture from the video on Discrete Circulation-Preserving Vortex Sheets for Soap Films and Foams. See link below. 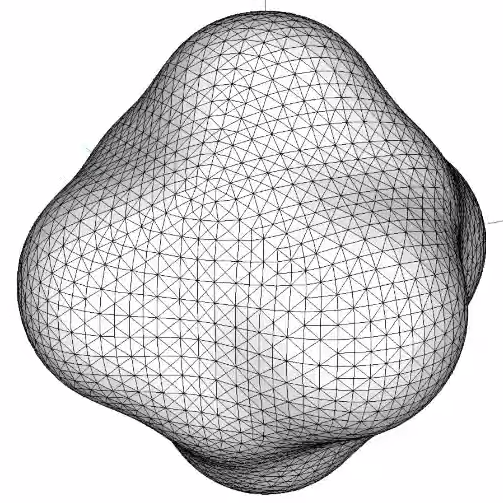 Submitted by blog reader and fluids researcher Dr. Christopher Batty comes this video on “using non-manifold triangle meshes to animate soap bubbles, films, and foams, using a method based on the equations of vortex sheets.” The work is the subject of an upcoming SIGGRAPH paper. Be certain to watch the video all the way to the end (it’s only 5 minutes) to see the bubbles popping. The Living Heart Project created this model using SIMULIA. Image from Desktop Engineering. Click image for article. Desktop Engineering wrote about the use of simulation for medical applications. Here’s some award-winning CFD work on cooling data centers by a PhD student at SUNY Binghampton. Another CFD researcher, this one from the Shipbuilding Research Center of Japan, won the DNV GL COMPIT Award for his work in advancing the use of HPC for shipbuilding. MSC’s Apex is a finalist for a Stevie Award. And to round out the awarding of awards, ANSYS received a Confirmit ACE award for their customer service. Discretization is obviously a part of CFD and simulations in general. The image below is a screen capture from a video called Pixel WORLD that shows various particle-based simulations with a particle size coarse enough to give a voxel effect. Screen capture from the video Pixel WORLD, a montage of particle simulations on a coarse, voxel scale. Click image for video. But discretization is appealing in real life too as illustrated in the gorgeous photo below from Lernert & Sander called Cubes in which unprocessed food has been diced into perfect 2.5 cm sided cubes. Cubes: discretized food by Lernert & Sander. Image from Lernert & Sander. Click image for source. This entry was posted in Applications, Events, Hardware, News, Software and tagged 3-matic, ANSA, ANSYS, Apex, Beta CAE, CD-adapco, COMSOL, DARS, Exa, jobs, Materialise, meshing, MSC, Siemens PLM, Solid Edge. Bookmark the permalink.